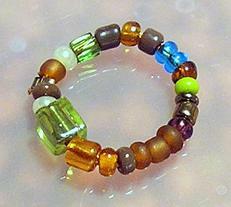 A beaded ring link. What the heck is that?Well, it's just a little 'ol ring of beads. Nothing fancy. 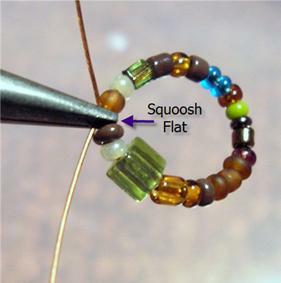 The most creative and unique jewelry often starts with the simplest of ideas. I'll show you how to make these and link them together. I personally like the idea of linking the beaded rings together to create a unique pair of earrings (not to mention a great gift idea for that hard-to-shop-for-girly-girl). Step 1: Cut a small piece of Tigertail or stringing cable. The length of cable depends on how big you want your ring to be, just keep in mind you will be running the cable through twice and will need some extra length. 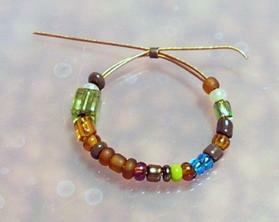 Next, string seed beads or other small beads onto your cable in whatever pattern you choose (be creative). Step 2: String a crimp tube onto your cable and pass both ends of the cable through in opposite directions. 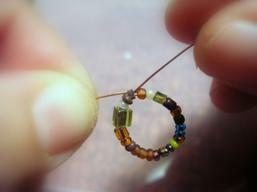 Step 3 : String the cable through your beads a second time. Step 4 : String through the crimp tube a second time, again passing the cable ends in opposite directions as in Step 2. Step 5: Using your chain nose pliers over crimp tube squoosh the crimp tube flat. Step 6 : Trim ends close to crimp tube. I left mine naked, but you can use a crimp cover if you like. You can link multiple rings together to create a chain. I think Ill be using this chain to make some earrings! 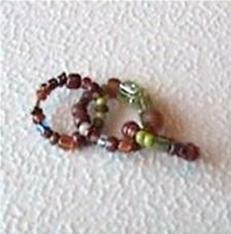 If you are going to link your bead rings remember to link them before you complete each link! 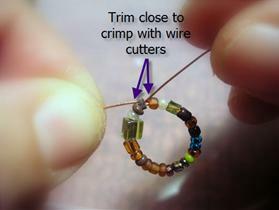 If you plan on using crimp tubes or crimp beads often, you may want to pick up a pair of crimping pliers. They are specifically designed to crimp in a two step process that will give you a much cleaner result than chain nose pliers. Experimentation is key in any craft, but certainly true here. Dont be afraid to try something different; you might surprise yourself with the results. What you have now is a distinctive beaded ring component that you can use for any jewelry idea you can dream up!